The bound manuscripts of the collection were originally part of George E. Nitzsche’s Memorial Library of the Publications of the University of Pennsylvania and Her Sons which was transferred to the University Archives in the mid-1940s. This collection is composed of four series, each concerning a different building’s dedication. The “New Engineering Building,” University House, Evans Dental Institute, and Medical Laboratory series are arranged alphabetically. The administration of Provost Charles C. Harrison, 1894-1910, was responsible for the second great building expansion at the University of Pennsylvania. Though most of the thirteen buildings erected during this time were for academic purposes, Harrison also had a concern for the extra-curricular life of the students, and so Houston Hall, the Dormitories, and the Gymnasium were built for the enjoyable social life of the students. Other buildings constructed under Harrison are the University Museum, the Chemistry Building, the Law School Building, the new Dental School Building, the Wistar Institute, the Flower Observatory, the Zoological Building, the new Laboratories of Anatomy and Physiology, as well as minor buildings and extensions. Being a private school, the University of Pennsylvania needed to seek funding for this expansion from private sources. The alumni proved to be a vital source of generous contributions to cover the cost of construction. Prominent among some of the later Harrison administration buildings were the “New Engineering Building,” the Medical Laboratory, the Thomas W. Evans Dental Institute, and the University House. The “New Engineering Building” of 1904-1906, later renamed the Towne School Building, was the largest University building at the time. This building was one of four on campus that the firm of Cope and Stewardson designed between 1900 and 1907. The other three were for the Veterinary, Law, and Medical Schools. 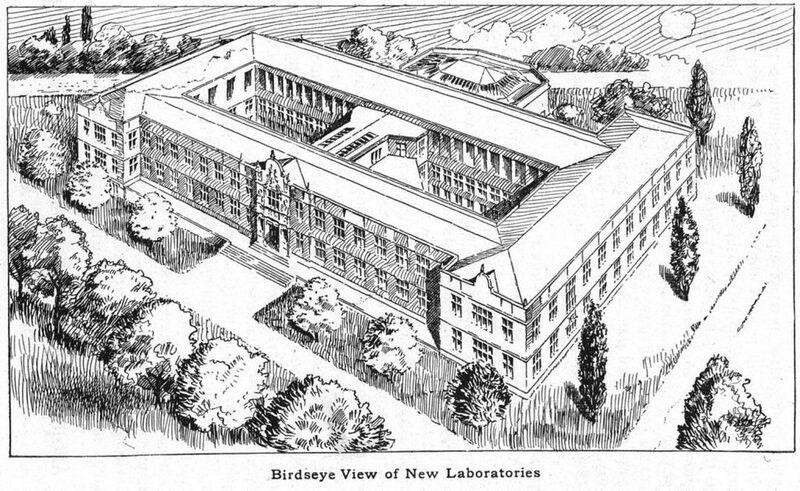 The Medical Laboratory of 1904, later renamed the John Morgan Building, was also a large structure, measuring 340 by 200 feet. After the death of Cope and Stewardson, the Thomas W. Evans Dental Institute finished construction in 1915 in consultation with the remnants of their firm. Also included in this collection is the 1907 dedication for the University House of the Christian Association at 26th and Lombard Streets, which held a gymnasium, a bowling alley, clubrooms, and classrooms. The University decided to take advantage of the publicity these large building projects afforded. Therefore, as construction was nearing completion on these buildings, committees were formed to prepare for their dedications. The elaborate ceremonies planned would prove to be great publicity opportunities for the University. This collection documents the preparations for the dedications of several buildings constructed at the University of Pennsylvania between 1904 and 1912. The records were compiled by George E. Nitzsche, the secretary of the building dedication committees, and later were bound into several volumes. In addition to containing the minutes of the committee, the volumes contain loose vouchers for the “New Engineering Building” expenditures and correspondence regarding invitations to dedication and arrangements for events. University of Pennsylvania Arts, Research and Culture House (Philadelphia, Pa.). University of Pennsylvania Evans Building (Philadelphia, Pa.). University of Pennsylvania John Morgan Building (Philadelphia, Pa.). University of Pennsylvania Towne Building (Philadelphia, Pa.). University of Pennsylvania. Committee on arrangment of dedication of the new medical laboratories. University of Pennsylvania. Committee on arrangments at the dedication of the new “University House”. University of Pennsylvania. Committee on dedication of the new engineering building. University of Pennsylvania. Committee on dedication of the Thomas W. Evans Museum and Dental Institute. University of Pennsylvania. School of Dentistry. University of Pennsylvania. School of Engineering and Applied Science.